Ground Ginger Powder contains gingerol, a substance with powerful medicinal properties. Ginger Root Powder may improve brain function. The active ingredient in ginger can help fight infections. Ginger has a long history of use for relieving digestive problems such as nausea, loss of appetite, motion sickness. Ginger can give relief from, arthritis, fatigue, headaches, muscle pain and supports healthy heart & immune function. Ground Ginger Powder has a sweet and spicy taste that is best used in smoothies, drinks, pickles sweet dishes such as cookies, biscuits, desserts. Organic ginger powder has an awesome smell and good taste that can never be got with ordinary ginger root powder. Ginger has unique anti-oxidants and nutrients like beta-carotene, calcium, magnesium, potassium, phosphorus, folate, and vitamin C. The phenolic compounds include gingerols and shogaols responsible for the anti-inflammatory properties. 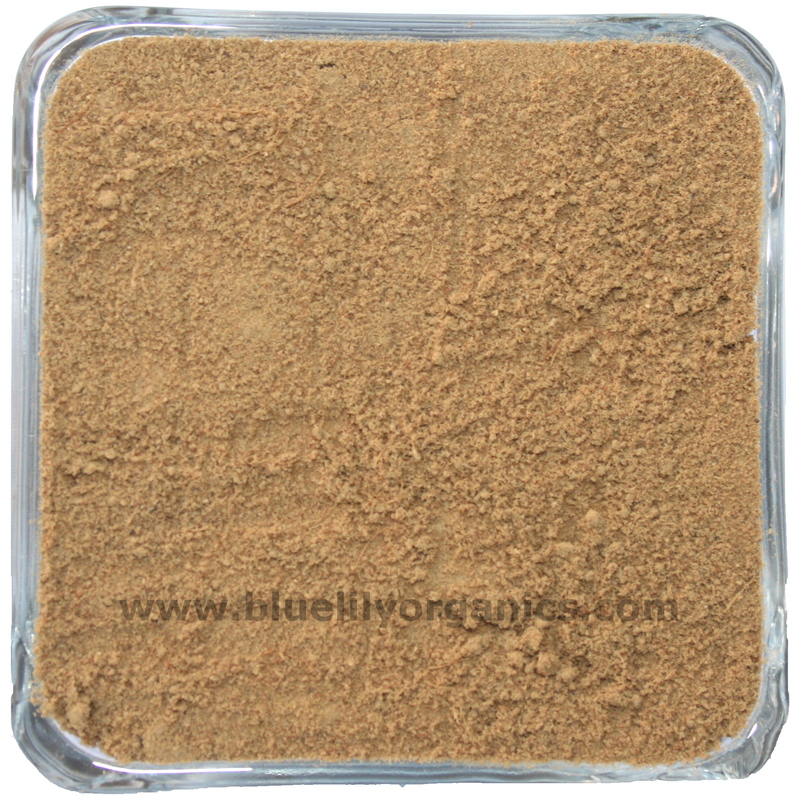 Blue Lily Organics Ground Ginger Powder is an aromatic spice. Excellent for Cold and Flu as a tea. 100% Vegan and Organic. Non-GMO, and contains no chemical pesticides, artificial additives or preservatives. Purchase with complete peace of mind. Ground Ginger Powder is native to South China. But as its popularity as a spice grew during the past centuries, its cultivation spread throughout Asia, India, and West Africa, eventually reaching far-flung regions like the Caribbean. This famous spice first made its appearance in Europe via the spice trade in the first century AD. Ginger can be enjoyed in a variety of ways; its rhizome is commonly eaten fresh (grated) or dried and powdered (ground ginger), and its oils are also extracted for therapeutic use. Ginger is a flowering plant that hails from the Zingiberaceae family; the same plant family as turmeric and cardamom. The woody rhizome of the ginger plant uses as a culinary spice. Although commonly referred to as “ginger root”, ginger is actually the rhizome, or underground stem, of the ginger plant. As the ginger plant ages, the oils present in its rhizome become more and more concentrated, as do its taste and healing properties. While young ginger rhizomes tend to be fleshier with a milder taste, mature rhizomes are drier and more fibrous, with a marked pungent or “hot” flavor. 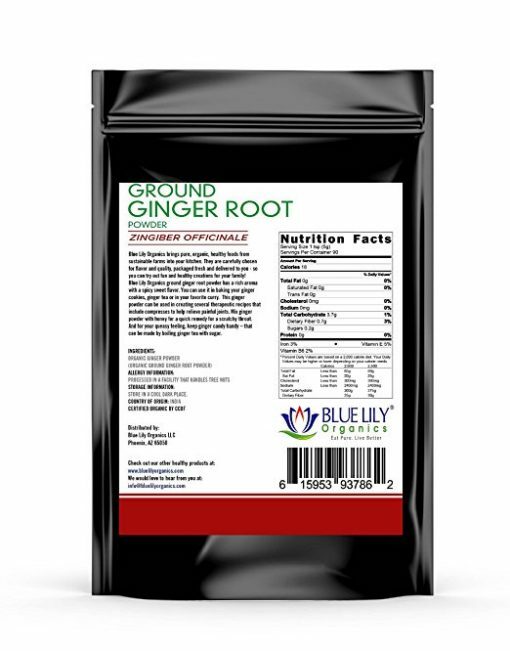 Blue Lily Organics Ground Ginger Powder is made from the dried rhizome of the ginger plant. It has ground to a fine powder and packed fresh to retain all of its potential benefits. Ginger’s healing power attributes to three compounds – gingerol, shogaol, and zingerone. These are also responsible for its signature taste. Ginger also contains capsaicin, which contributes to its warming and stimulating properties, as well as caffeic acid, curcumin, and salicylate. Ground Ginger Powder is also full of anti-oxidants and nutrients like beta-carotene, calcium, magnesium, potassium, phosphorus, folate, and vitamin C.
Perhaps best known as a digestive aid, the phenolic compounds in ginger help soothe gastric irritation and discomfort while stimulating digestion. Other ginger health benefits include its ability to ease uncomfortable flatulence and gas. Ground ginger powder is especially known for its ability to fight nausea. Eating ginger candies or drinking ginger tea has long been a popular cure for morning sickness. Modern studies are beginning to corroborate ginger’s reported ability to ease bodily aches, suggesting that it may help relieve minor muscle discomfort. Recent studies also support other ginger benefits, for example, its traditional use in soothing menstrual symptoms. This relatively recent research has made ground ginger powder supplements more sought-after than ever before. 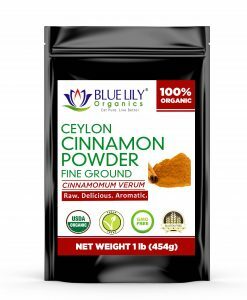 In cooking, Blue Lily Organics ground ginger powder pairs surprisingly well with oranges, melon, pumpkin, apple, and other spices like garlic powder and turmeric powder. 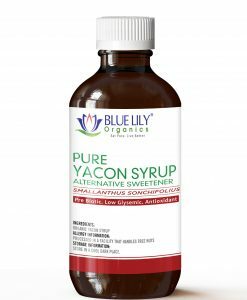 As a rule of thumb, substitute approximately 1/8 teaspoon of Blue Lily Organics Ginger Powder for one tablespoon of fresh ginger. Add Blue Lily Organics Ginger Powder to your stir-fries, curries, and seafood dishes, or to roasted vegetables like carrots and sweet potatoes. Blue Lily Organics ground ginger powder also lends a nice accent when incorporated into salad dressings and warming, cold-weather soups. In baking, Blue Lily Organics Ground Ginger Powder adds a sweet bite to everything from cakes and gingerbread to ginger snaps. Just ¼ tablespoon of Blue Lily Organics Ginger Powder in boiling water makes a spicy, energizing tea. Steam a small amount of ginger powder in water to release the healing properties of its essential oils, and inhale to open up the sinuses and aid with congestion. 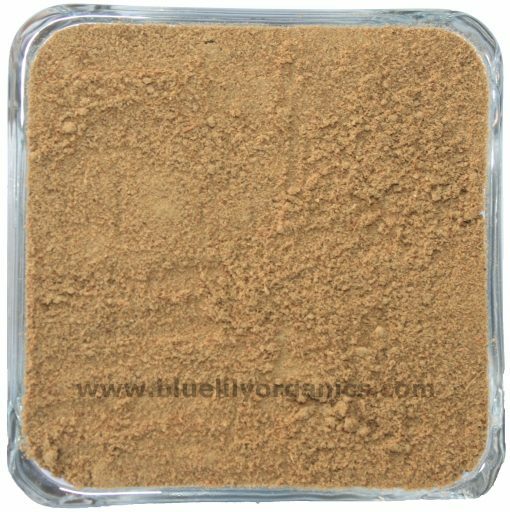 Blue Lily Organics ground ginger powder combined with honey, another tried-and-true healer. It makes a soothing balm that can provide comforting relief to the throat and mucous membranes. Make your own candied ginger by boiling ginger tea together with sugar. Keep your home-made ginger lozenges handy on-the-go for nausea while traveling or morning sickness. Blue Lily Organics Ginger Powder can even be used topically to ease minor muscle discomfort; just soak a cloth in warm ginger tea and apply to the affected areas. Ginger powder stores excellently. To maintain the potency of Blue Lily Organics Ginger Root Powder, store in an air-tight container and place in a cool, dry place. Keeping Blue Lily Organics ground ginger powder in a tightly-sealed container in the refrigerator will extend the shelf life even longer. Blue Lily Organics Ginger Powder is non-GMO, and naturally-grown with no chemical pesticides. It contains no artificial additives or preservatives and is 100% USDA Certified Organic.